These static cling ADA window decals can be placed on the inside of windows to let customers and visitors know your store, business or property is ADA compliant and has ISA wheelchair accessibility. Static cling ADA ISA Window stickers can be removed and replaced any time, and do not leave any adhesive residue. Unlike cheap window stickers printed on transparent material, our static cling ADA ISA window decals are printed on opaque white material--providing much better visibility. 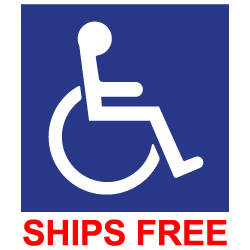 Note: This is a window decal, and not an ADA compliant sign. Decals do not have tactile text or Braille. Federal Law: 703.6.1 Pictogram Field. Pictograms shall have a field height of 6 inches (150 mm) minimum. Characters and braille shall not be located in the pictogram field. CA Title 24: Pictorial symbol signs (pictograms). Pictorial symbol signs (pictograms) shall be accompanied by the verbal description placed directly below the pictogram. The outside dimension of the pictogram field shall be a minimum of 6 inches (152 mm) in height.